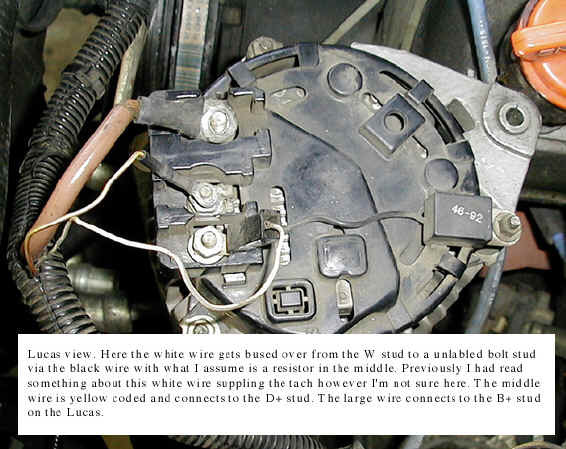 I grabbed this alternator page from www.rangerovers.net so I wouldn't lose this information. Thanks John Brabyn and John Lewis. one for an 84 GM P-30 chassis. It's 94 amp. extended though, but that was not a big deal. Wiring is simple with the Delco too. Heavy brown battery lead attaches to the Delco "Battery" terminal. 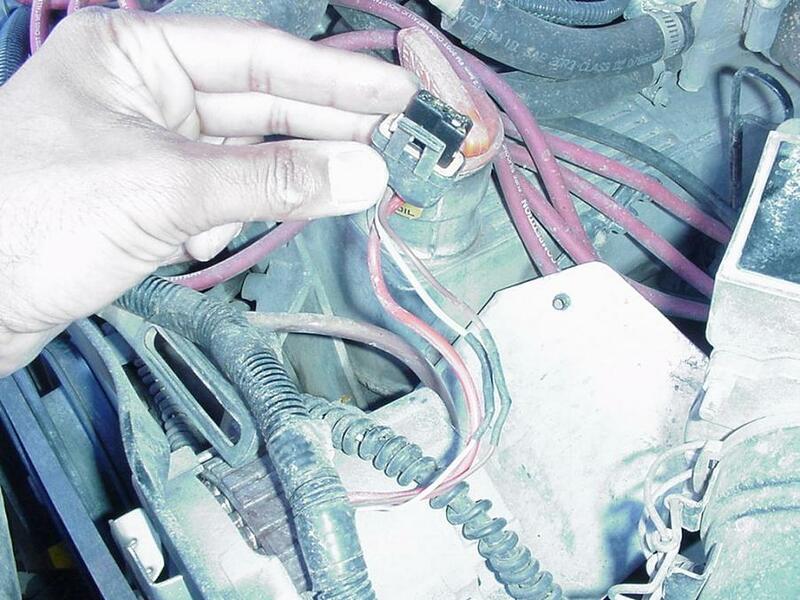 #1 goes to the warning light, which is the small brown and yellow wire. read a bit off, but it will work. I put the old capacitors back in the same place they came off the Lucas. so it isn't always that simple. brighter, and the engine cranked faster and started quicker. The conversion covered in this article for RR up to 92 model year  when serpentine belt came into production. Of course you can still do the conversion even if you serpentine arrangement, youll need a different type of pulley. This alternator is found on late model GM truck with HEI and fuel injection. The computer for HEI requires a good, clean source of power so thats why I chose this model alternator. It puts out 100-130 amp at idle depending on load. Most alternators need to be excited by revving up to 1000 or higher rpm in order to activate the field and output higher current. At idle I turned on both windscreen defroster, lights on Hi beam, heater blower on high and the alternator put out about 100 amps approx. My old unit used to squeal when it experienced a high load! Basically youll need a longer upper bracket and a longer belt. 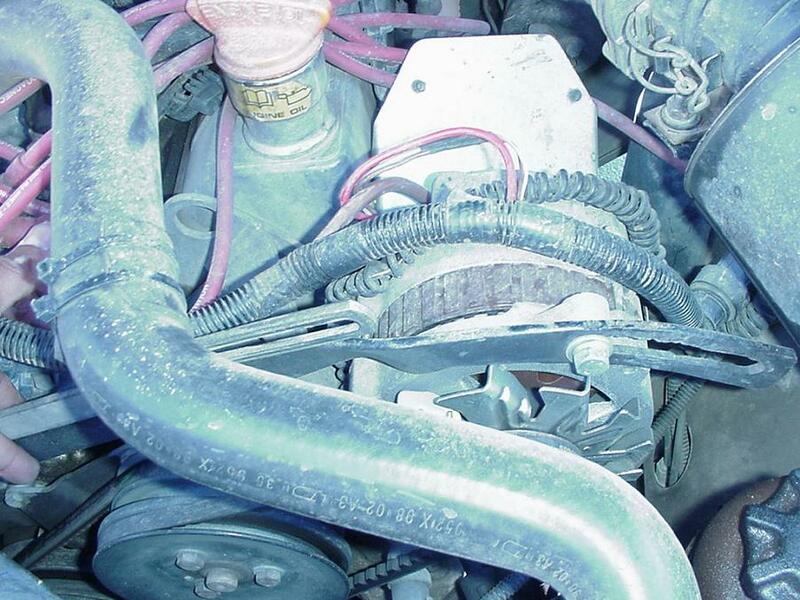 Any competent alternator shop can hook up for you the Repair harness to your wires. Technically you can do all the work yourself if youre comfortable with wiring and reading schematics. There is a simple schematic on the back of your Owners manual that should suffice if you dont have a repair manual for your rig. Youll need to make up a top bracket like the picture. Im also showing the colors for the wires: slate to harness white, brown to harness brown. The upper bracket was made out of a 1x1/8 steel. I heated up at the right place then put a twist and a bend in it so that it lines up with the upper bolt on the unit. A slotted hole is used for adjusting the belt tension. An important thing to remember is that the new pulley must be EXACTLY the same diameter as the old one. Im referring to the diameter of the belt contact surface not the actual diameter of the bore. Smaller pulley = faster tach and vice versa. 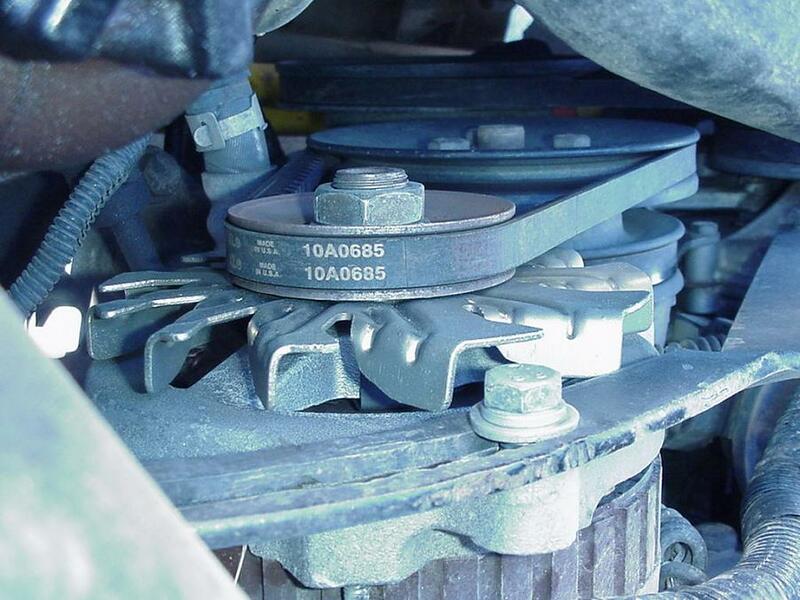 If you use too narrow of a belt, then your tach will read higher as well! So belt thickness does matter. I found that Gates Rubber company has all my belts and theyre very cheap. You can find them in any industrial parts house and some auto parts stores. Incidentally, I use Gates rubber for everything, including couple of hoses! Longer belt  Gates Rubber 10A0685. 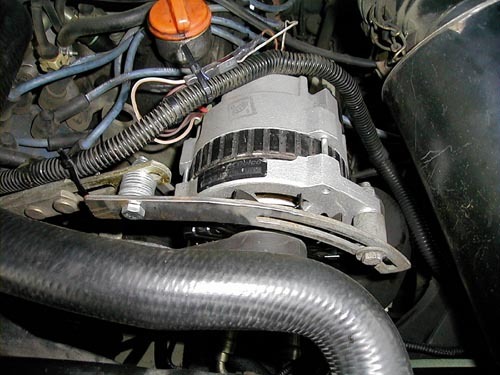 Installing the newer style Delco alternator in a 1993 4.2 Range Rover. My Morrelli alternator reluctantly died after 10 yrs life. One evening the engine began to sputter badly and the headlights went dim. Regardless, I drove it for 50 to 55 miles before arriving home. After pricing the replacements at Rovers North I decided to try the Delco solution posted at jpurnell.com. Unlike Johns examples the Delco I purchased (US$ 94.00) required using a CS style pigtail. Make sure you get a 4 wire pigtail as many of the CS style clips only feature 3. The clip cost US$ 17.00. 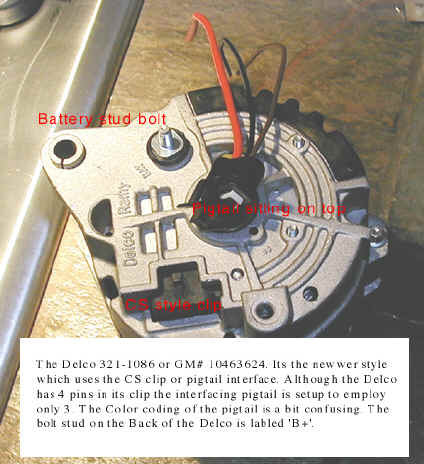 I removed the Morrelli with the intent of swapping its pulley wheel for the Delco's. This was easy. It allowed me to use my original serpentine belt and solved the problem that the Delco size wheel caused. My next step was to seat the Delco in however its hinge clearance was smaller by an 1/8 in. I shaved it using a benchgrinder and it bolted right in. I also extended the stock alternator arm bracket by bolting another 'J' style arm to it. Instead of heating and bending the arm I found that using to 3/4 inch spacers worked best for me. 1. P gets wired to the white rover wire which feeds the tach. 2. L & I/F get joined to connect to the yellow rover wire. 3. S gets bold to stud on the back of the alt along with the 1/2 inch braided rover wire. I used solder to mate the leads and Xtreme brand tape for sealing. Amazing stuff that Xtreme tape, only bonds to itself. Once assembled I reconnected the battery, plugged in the radio code, and viola! A cheap replacement that can be found just about anywhere you are in the US. On the down side I'm told that I won't get the lifespan out of it that I did with the Morrelli. Apparently Delco makes cheap and nasty. I was also told there would be a faint whine when it was taxed with a heavy load, although I haven't heard it yet. I removed my alternator today while making room to work on the hose replacement. Looked for some numbers and this is all I found on it. I *believe* that this is a GM alternator. If anyone wants to look this up and see what it is, be my guest. The only adaptation it needs is a 1/4 inch shim between the rear of the rear-most lower mounting ear and the bracket. It comes with a V-belt pully so if you have a multi-groove it will need to be swapped (which I did). The electrical connection is very simple, it has 4-wires, only two of which are used. I forgot to write down which I used and where they went, but the tach and charge circuit work perfectly. Add this to the collective database. There's also a conversion to a Bosch 120Amp alternator. Here's the link. a writeup on the Delco if you're interested. I've said it before, I will say it again...on V-belted Rangies the 89 Eagle Medallion Delco drops right onto the original mount and belts right up. You need an extended tensioner if you feel the need for one - ran mine for over a year without and had no issues with the belt loosening. No fancy brackets, no BS - bolts right up and connects up. The only mod required is a wire to one of the diodes for a tach signal - and that's literally 2 minutes with a soldering iron.